LJUBLJANA, SLOVENIA, 25 May 2018—More than two dozen Slovenia government representatives and NGOs completed training this week with Global Footprint Network, an international research organization, as part of a project to incorporate the Ecological Footprint into national environmental and development strategies. A press conference to outline more details about the project will be held at 10:00 a.m. May 25, 2018 at Ministry of the Environment and Spatial Planning, Dunajska c.47. 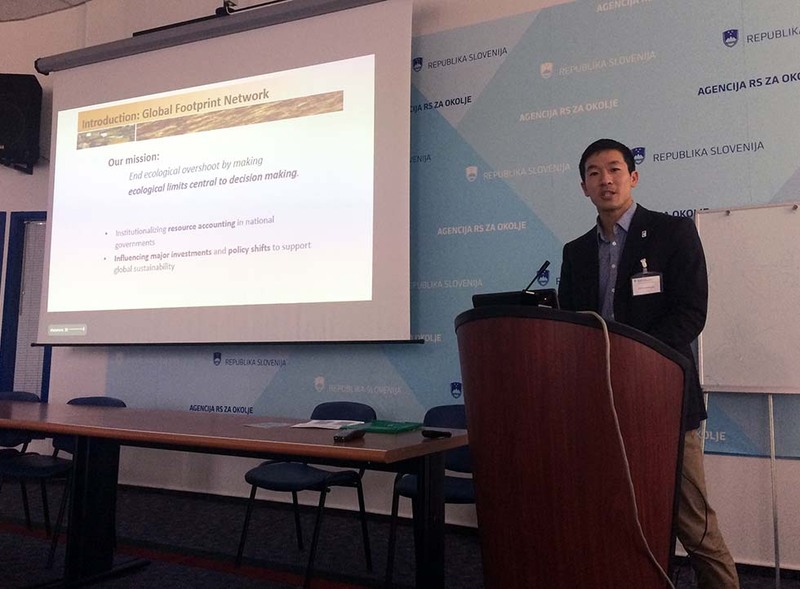 The trainings on May 23 and 24 were led by Global Footprint Network Research Director Dr. David Lin and organized by the Ministry of the Environment and Spatial Planning, the Slovenian Environment Agency, and the Slovenian Institute for Youth Participation, Health and Sustainable Development (IMZTR). They were attended by representatives and experts from the Ministry of the Environment and Spatial Planning of the Republic of Slovenia, Slovenian Environment Agency, other ministries and government agencies, scientific and expert organisations and NGOs Focus and Umanotera. The project began earlier this month and will continue into the summer with deeper analysis of Footprint trends in Slovenia. The Ecological Footprint measures a population’s annual demand for natural resources, including food, timber, fiber, and absorption of carbon emissions. It can be compared to biocapacity, which measures a region’s annual capacity to regenerate such resources. The Footprint is the only comprehensive resource metric that can be scaled from the individual level (with an online personal Footprint Calculator at www.footprintcalculator.org), to cities, regions, countries, and the world. The average Ecological Footprint in Slovenia is 4.7 global hectares per person, the same as the average in the European Union. However, that is more than two times the biocapacity of Slovenia, and nearly three times of what’s available globally per person. The carbon Footprint makes up about 60 percent of Slovenia’s Ecological Footprint, similar to the global Ecological Footprint. 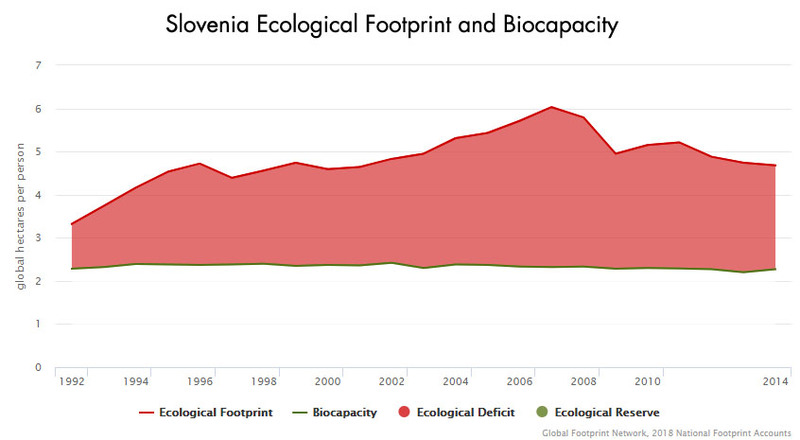 The Ecological Footprint was recently adopted as a strategic indicator for both the National Development Strategy and the National Environmental Programme of Slovenia in order to measure current natural resource supply and demand and better understand historic trends. This information will then be used to help guide future policy and investment decisions for Footprint reduction. Slovenia is among more than a dozen countries who have used the Ecological Footprint to help guide environmental policy. Others include Ecuador, Japan, the Philippines, Switzerland, and the United Arab Emirates. Ecological Footprint data from countries around the world is available on the open Footprint Explorer data platform: data.footprintnetwork.org. Follow #MoveTheDate on social networks.